legs splayed, plucked clean by the waves. shuttling eternally in the limbo of the tides. For life is not a river, but an estuary. like salmon to the spawning ground. unidentifiable fowl returning like the Antichrist. The sodden tennis ball bounced back. returning to the land of its extraction. Richard Schiffman is the author of two biographies and a widely published poet. He is also a journalist specializing in the environment who regularly contributes to leading publications including The new York Times, Scientific American, the Atlantic, and the New Scientist. His nature poetry reflects his love for the earth and his belief that understanding its threats are the only hope of saving it. This poem was published in Schiffman’s new book, What The Dust Doesn’t Know, Salmon Poetry, 2017. Link here to learn more. Very powerful piece. The painting of life as “not a river, but an estuary” is very relevant to issues of the environment. Pollution does not as easily flow out of our communities as we may wish to think it does. As soon as a piece of waste leaves our sight it is more blissful to think that it will end up somewhere it should, which is often not the case. We often fail to take note of just how much we use up in our day-to-day life, and how much of that will never be broken down. We have become used to a lifestyle of convenience and replicability- disposing of waste is a daily occurrence, and happens without a second though of where this material can end up. The Earth can only handle so much before it is pushed past its limit. As Schiffman excellently states, “man does not live by bread alone”. The imagery in this poem is particularly powerful. The line “whole rafts of trash sailing upriver like salmon to the spawning ground” presents a fascinating juxtaposition of the artificial and the natural, and the allusion to Ecclesiastes brings in interesting questions about the inevitability and immortality of trash. Richard Schiffman’s poem speaks truth as he informs, shocks and rebukes in one compact breath. This poem isn’t just well=creafted — it’s a classic, deserving of widespread readership. How mindlessly we live, untethered to the reality of the fate of the detritus of our lives. Rivers don’t always end up in such sorry shape, and much of the time our trash does “disappear from sight.” But that’s not the point. It (the trash) does not disappear from earth. And what will that mean two centuries down the road? This poem reminded me of just how much “stuff” we all have in our lives. Anything we do requires so many small objects. There is no other creature that needs so many external things to live. The poem’s imagery reminds me that we need to limit how much excess we have, and treat all of the “stuff” we have as though it’s a prized possession. Plastic, especially, takes hundreds of years to biodegrade, and should be treated as such. While trash that we produce seems to leave our minds as soon as it leaves our vicinity, it’s inevitable that we encounter it again. 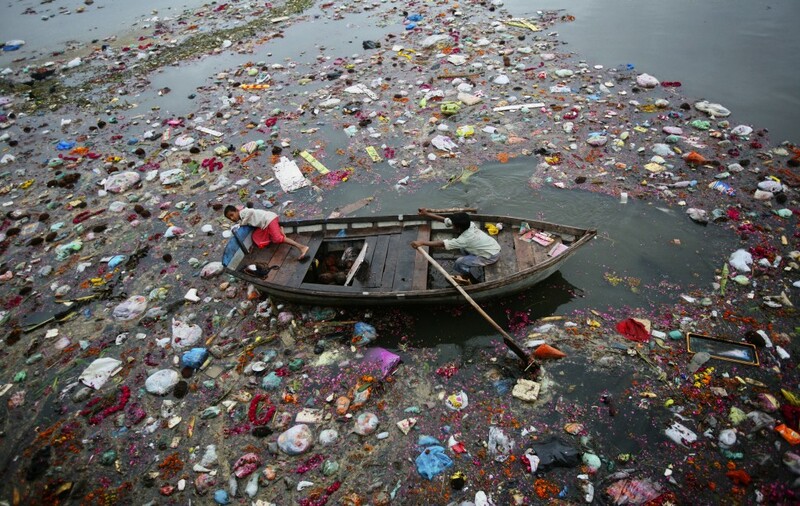 Whether through plastic remnants in a fish we eat, or through witnessing a glaringly ugly sight of trash in a river. It’s essential we become conscious of this through every step that we take. This poem needs to be read and seen by more people. We like to stay in our little bubble and an idea of convenience makes people blind to what impacts they are creating. Honestly, it’s much easier to order a cup of coffee at a cafe with plastic cups they provide, rather than bringing my own mug cup. And most of the times in the past, if I did not see a recycle bin in the street, I didn’t care to properly recycle the plastic cup. We need to be more proactive and educate people how our behavior will eventually lead us to a place where we can no longer come back. I really like this poem! In particular, I like the religious imagery throughout the poem as it calls into questions one’s own morals in the context of waste production, as Nicholas mentioned. The emphasis on the condom as a “false prophet” in particular in relation to the religious imagery is quite powerful, as it comments on human hedonism as a driving force behind environmental degradation. I believe that humanities and the arts are often left out of academic environmental discourse, and this poem proves that poems and other art forms can powerfully convey environmental messages. I love this poem and how it reminds us that the earth has a tipping point and that our wasteful behaviors will eventually come back to hurt society “when the current flips directions”.